It seems like any time Grambling State and Alcorn State get together, championships are on the line. That may be the case again. On Saturday a group of familiar foes in Grambling and Alcorn State will met again on the gridiron in Lorman, Mississippi for the seventh time in the last three seasons. The Braves and the Tigers both come into Saturday’s game the same that they have during the previous six meetings: in the thick of the conference title race. The Braves come into Saturday’s contest with a 5-2 record overall and a 3-1 record in conference play. ASU was upset two weeks ago on homecoming by Alabama State but bounced back a week ago to return the homecoming spoiling favor to Alabama A&M. Grambling State will roll into Lorman with a 3-3 overall record and a 2-1 record in SWAC play after going on the road a week ago and defeating Texas Southern. Both the Braves and Tigers come into Saturday’s contest with a sense of urgency since both have already dropped a conference game. A second conference loss could potentially knock either out of title contention. Saturday’s game has a lot at stake for both schools but this isn’t new in recent history as half of the last six meetings were in the SWAC Championship Game. Grambling State and Alcorn have tangled 69 times and have had classic games that featured names like Robinson, McNair, Driver, and Nord just to name a few, but it’s the 70th meeting on Saturday that could alter the season for both schools. The Braves come into Saturday’s game trying to do something that they haven’t done since 2013: beat the Tigers during the regular season. That 48-0 win against the G-Men in The Circle City Classic feels like ages ago from the Braves as Grambling has won the last four regular-season meetings and two of the three meetings in the conference title game. For the Braves to secure a win at home they must avoid turnovers which have plagued them over recent regular-season meetings against Grambling. Over those matchups Alcorn averages 4.6 turnovers per game and in the last two regular-season matchups against Grambling the Braves have lost by 35 and 21 points. Noah Jonson and company must take care of the football this week. The Braves now have the top-rated offense in the league averaging 472.4 yards per game to go along with the league’s top defense which only allows 251 yards per game which is also ranked fifth nationally. The Braves will have their hands full on Saturday with a Grambling offense which has seemed to improve since its loss to Prairie View in the State Fair Classic. The Tiger offense has amassed tons of yards and points with quarterback Geremy Hickbottom leading the way. No disrespect to Oklahoma Panhandle State and Texas Southern, but this Tiger offense will get a true measuring stick as to how much it has improved on Saturday against the Alcorn State defense. Defensively the G-men haven’t been as dominant as many had projected them to be. However, the Tigers have shown that they aren’t too far away from being the dominant defense that they were a season ago. Junior defensive end Anfernee Mullins has turned it on in recent weeks with four sacks in the last three games and a league-leading five sacks so far on the season. If Mullins can get to Johnson often on Saturday that completely changes the complexion of the Alcorn State offense. Johnson is the fifth leading rusher in the conference with 539 yards rushing on the year. The Grambling defense is now ranked third in the conference and like the Grambling State offense, ASU will be a true barometer as to where this defensive unit stands. Both teams come into Saturday’s game with conference title aspirations still attainable but after the game on Saturday one of these teams’ title hopes will take a major hit. 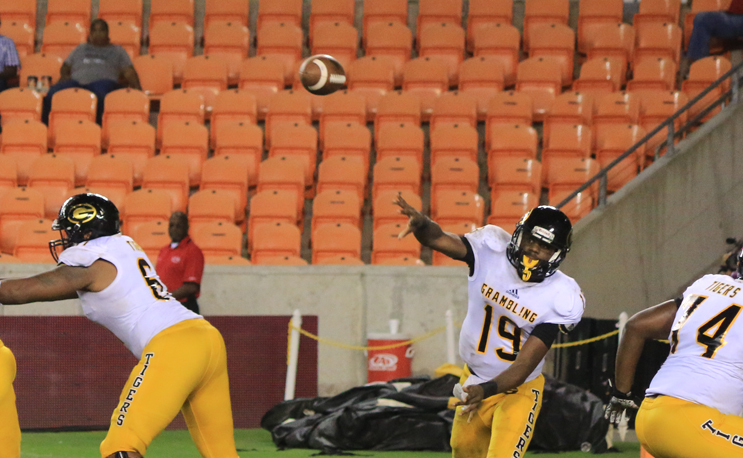 For Grambling they need to continue to win to keep pace with Prairie View and Southern. The G-Men will have Arkansas Pine-Bluff, Mississippi Valley State, and Southern in their final three conference games. The November 10th matchup at Alabama A&M will not count towards the conference standings for Grambling. As for ASU, it visits Prairie View next week before it steps out of conference on November 3rd to faceoff against FBS New Mexico State and then returns home in the regular season finale to face off against hated rival Jackson State at home in The Soul Bowl.